Stinger Season Cairns and Port Douglas. Stinger season Cairns, Port Douglas, the Great Barrier Reef area and the whole of Far North Queensland is something you need to be aware of. Insider knowledge on how to be safe, for you and your kids is essential. We lived up here for 6 years safe from jellyfish, so read on. Dates for Stinger Season vary, fixed dates don’t exist. 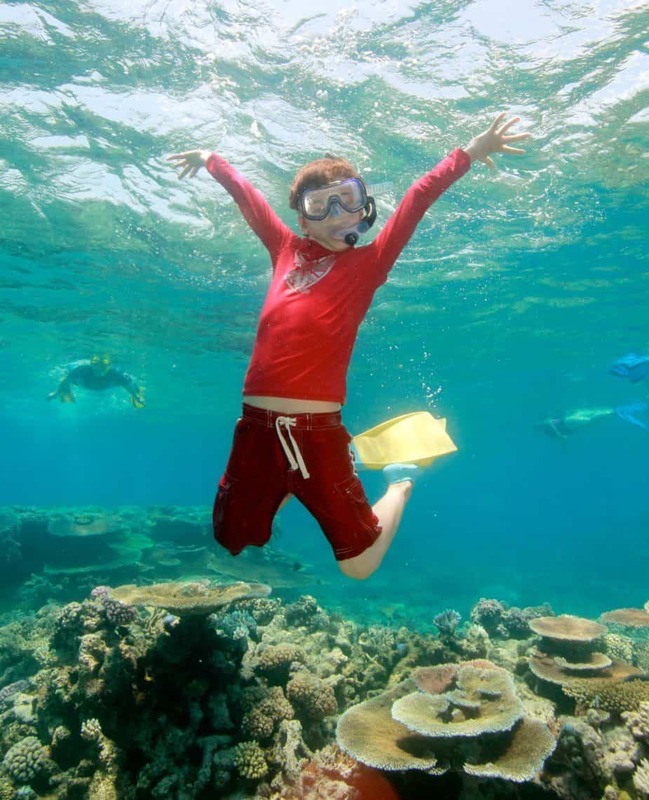 but if you’re heading to Queensland in the summer time or wet season you need to know where and when to swim safely, what to wear, where the stinger nets are and how your Great Barrier Reef tour or trip will be affected. It’s all on this page. Today- March 2019, yes it is stinger season. There are more creatures to consider in this part of the world, starting with salt water crocodiles, you can read what life is like for us living with these prehistoric monsters or discover where to spot our crocs in the wild, I kinda love them. It’s not just the stingers, crocs, snakes and spiders that are out to get you, we also have a stinging tree, but seriously, don’t worry! She’ll be ‘right, as they say in Australia. We hope you enjoy your visit to our old home ( we left to travel the world, long story, it wasn’t because of the wildlife) and that you get the most out of Far North Queensland. Marine Stingers and Dangerous Jellyfish, What are they? Is it Still Stinger Season Today? When is Stinger Season Around Tropical North Queensland Region? The Stinger Nets Will be Out. How Will Stinger Season Affect Your Great Barrier Reef Trip? Is it Safe to Swim in Stinger Season? You Decide. 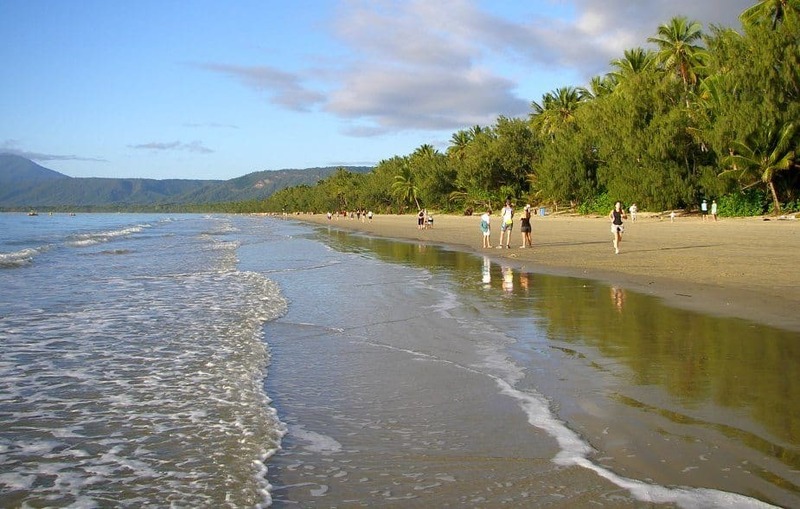 Other Places to Swim Around Port Douglas and Cairns, Swimming Holes, Pools and The Lagoon. A day on the Great Barrier Reef, a dream come true, but will your day be affected by our marine stingers? This visit was in winter (Southern Hemisphere winter ) so no stinger suits on this occasion but in the wet season yes, you will need a stinger suit. Where are the stinger nets? How to stay safe in the nets and outside. What to wear? Stinger suits and where to buy them. Is the reef safe in stinger season? Where are the freshwater swimming holes? 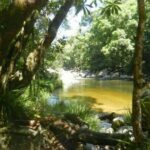 You don’t have to swim at the beach, there are plenty of safe, beautiful swimming pools, fresh water swimming holes, waterfalls and secret jungle pools to enjoy around Cairns and Port Douglas. The two most dangerous jellyfish, the ones we worry about in stinger season, are the box jellyfish and Irukandje. The most poisonous and deadly jellyfish in the world likes to hang out around Australia. The venom can kill in minutes and is the cause of an average 1 death per year in Australian waters. There are more deaths in South East Asia, where stinger nets are rare. This jellyfish can get large, with tentacles stretching up to 3m behind it. The tiny Irukandje is the smallest member of the box jellyfish family, it takes its name from the Irukandje people of Northern Australia and measures around 5mm in diameter. It’s tentacles can be up to 1m long. Its tiny size is deceiving as its venom is incredibly strong. Death isn’t inevitable, but Irukandje syndrome isn’t a nice thing to have, symptoms include severe muscle cramps, intense back pain, vomiting, racing heart and a feeling of intense doom. The Irukandje is the reason many of us wear stinger suits inside the nets, they can be tiny enough to pass through the mesh of the net. Beautiful Four Mile Beach, Port Douglas, on a very busy triathlon morning. This is a crowd in our part of the world. If you’re here just for the hard facts, Stinger season is roughly November to May, but there is more to the story than that. In Port Douglas, down the road in Cairns and throughout Far North Queensland including the Whitsundays, Townsville and Hamilton Island, stinger season comes with summer Things get sticky and with the heat and humidity come the most dangerous jellyfish. We call them marine stingers. However, some jellyfish can be here all the time, we don’t worry about them too much. The occasional blue bottle, lonely jelly blubbers and swarms of annoying sea lice visit from time to time, they aren’t a big problem, summer is the real danger time, we call it stinger season or jellyfish season. Beautiful Port Douglas. But is it safe to swim? Yes, today, April 8th 2019, the stinger nets are still out, it is still stinger season. 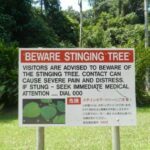 I keep this post as updated as possible ( but obviously – we travel full time, I’m often offline) and I’ll post here when the stinger nets are removed. The further north you go, the longer stinger season lasts, the marine stingers enjoy warm water and hanging out in mangroves. Exact dates vary, there is no fixed point but generally expect the season to run from November or December to March between Gladstone and Townsville, October to June in the far north. While we’ve been living in FNQ the stinger season Port Douglas has generally lasted from November to May, Cairns will be the same. Stinger season Port Douglas and Cairns stretches from around the first of November to May, the stinger nets will be in the water as soon as there is any possible danger. The best times for swimming here, we think, are on the shoulders of stinger season, just before and just after the stinger nets go out. The water is warm and can be crystal clear, you’ll find us hitting the beach with the kids most days then. There is a stinger net at the lifeguard station at the top end of Four Mile beach, Port Douglas. 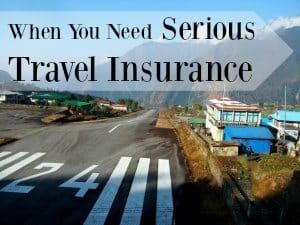 Tourists use it right through stinger season. The net is occasionally closed in stormy weather. 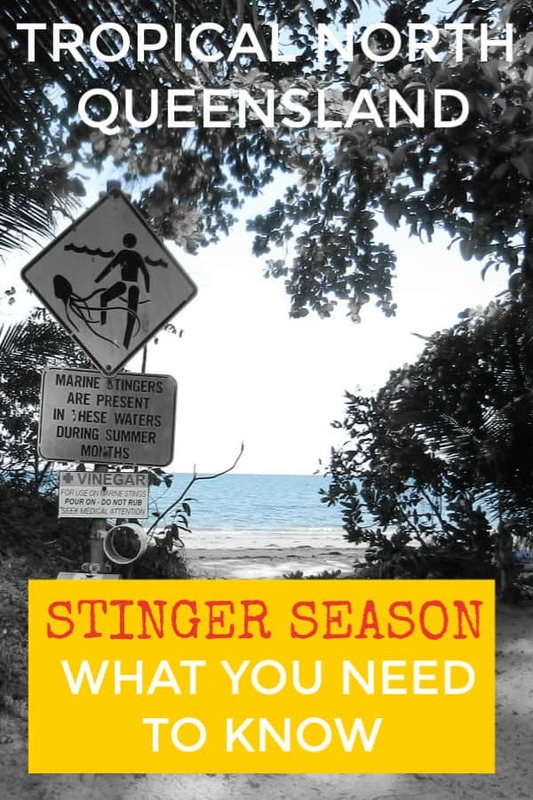 You’ll also find stinger nets at Palm Cove, Clifton Beach, Yorkey’s Knob, Holloways Beach, Trinity Beach, Kewarra Beach and Ellis Beach, most beaches in the area. Things are safer on the Great Barrier Reef, your chances of encountering stingers are very, very small. All reef charter boats have head to toe Stinger Suits on board for snorkellers to hire. They’re not elegant, but you need to wear one in stinger season. 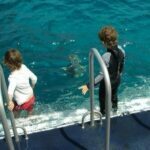 It’s a great idea to buy a suit for your kids to keep our fierce sun off their skin, along with the marine stingers, this is perfectly normal in Australia, many kids wear them at any time of year. 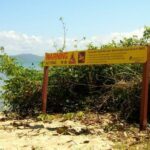 Stinger warning signs like these are on the Cairns and Port Douglas region beaches year-round, the bottle beneath contains vinegar, a good treatment or some stinger stings. You’ll sometimes see local children in full body stinger suits, exposing only fingers and faces, inside the net. Stinger nets are potentially not 100% effective, tiny jelly fish can still, possibly, pass through. Don’t be put off, you’ll also see plenty of people in bikinis. The stinger suits serve a dual purpose, we also use them to protect our kids from the sun. The lifeguards drag the net every day to check for any unwanted visitors, look out for them, it’s interesting see all the small fish and invertebrates they catch, they’re a friendly bunch, say hi. Out on the reef the risk of marine stingers is even lower but reef boats carry stinger suits to loan or hire to all passengers. If you are snorkelling on The Great Barrier Reef you will be required to wear one. Likewise, if you are learning to scuba dive, enjoying a trial dive, taking a liveaboard dive trip or anything else that puts you in the water, you’ll need a stinger suit. Stinger suits are also a very good idea to protect your children from the harsh Queensland sun. High UV levels in Cairns and Port Douglas make stinger suits or sun protective suits a very good idea, even outside stinger season. If you’d like to buy your own stinger suits to use on the beaches as well as on the reef, have a look here for kids’ and adult’s stinger suits and rash vests. ( works for USA, UK and more) if you’re wanting to buy stinger suits in Australia, try here. 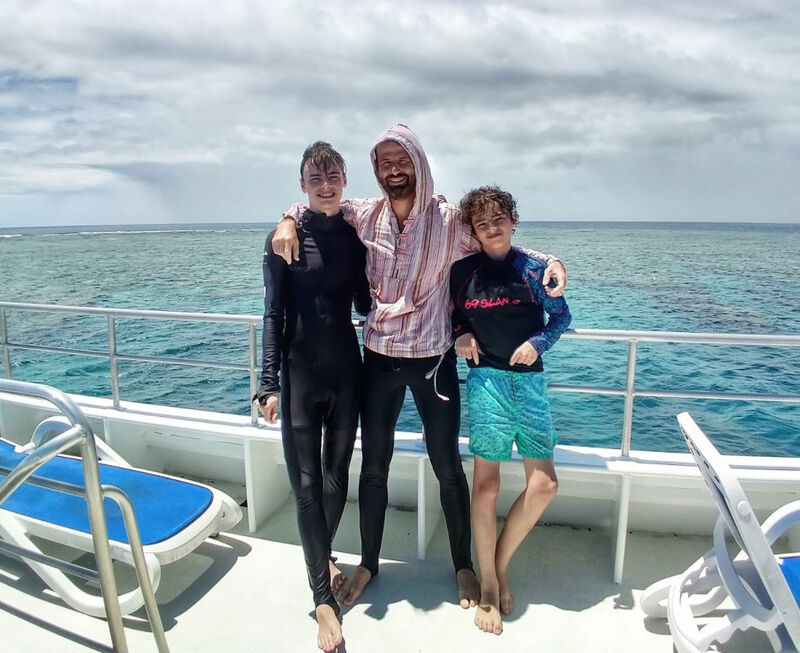 My family visiting the Great Barrier Reef in stinger season. The black stinger suits were provided by the charter boat. My younger son wore his over his rashie and shorts. The suits have hoods and mittens leaving only tiny areas of skin exposed. Check the lifeguards’ instructions on the boards, you’ll find them on the beaches. If the lifeguards say it’s safe, only swim in the stinger nets. Wear a stinger suit or as much body protection as you can, rashies and board shorts help. Do not touch the nets themselves, stingers could be caught in the net. For my family, we reduced our sea swimming in season, after all, we lived here all year round and could swim any time. We continued to visit the reef and felt very safe, stingers like to hang out near the coastal estuaries. It’s great to visit hotel pools, the Cairns Lagoon, or some of our natural, fresh water swimming spots at this time of year, after all there are plenty of other things to do in Cairns or Port Douglas. Sensational Sea Temple Port Douglas, we’ve stayed here many times and enjoyed this pool, see link below. If you are staying at any of the Port Douglas hotels, chances are you will have a pool. But there are also nearby fresh water swimming spots to try. Most places in Port, from camp sites to hostels, have their own pools. Top end Sea Temple (pictured above) has an outstandingly huge and luxurious pool with lagoons, rivers, a hot tub and bridges to swim under, it’s one of the biggest and best in the world and we would spend every Christmas there along with many locals. The pool at The Sheraton Grand Mirage is even bigger. QT Port Douglas- Now Renamed-Oaks Port Douglas( opens in a new tab)Modern and cool with fun pools for kids and adults. 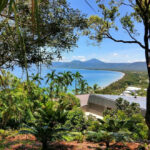 Pullman Sea Temple Resort and Spa Port Douglas (opens in a new tab) My favourite! Just back from the beach, at the quiet end, away from the crowds. A huge lagoon pool and a luxury swim-out or plunge pool experience. Sheraton Mirage Port Douglas (opens in a new tab) The classic. Close to town and beach-side. A vast lagoon shelving into a sandy beach area. The original in Port. Novotel Cairns Oasis Resort Novotel are a great up-market chain of hotels and they do family and kids really well. We always expect high standards with Novotel. Sea Temple Resort and Spa Palm Cove The sister hotel to the Port Douglas Sea Temple. Beach =side in Palm Cove. There are some really lovely places to swim around Port Douglas, some of the hotels allow visitors to use their pools if they are buying food or drinks and Mossman Gorge ( click here for rainforest swimming information) is just up the road, perfect for a cooling dip in an icy cold rainforest stream. Cairns has one of the most amazing Lagoon pools in the world, and it’s free. 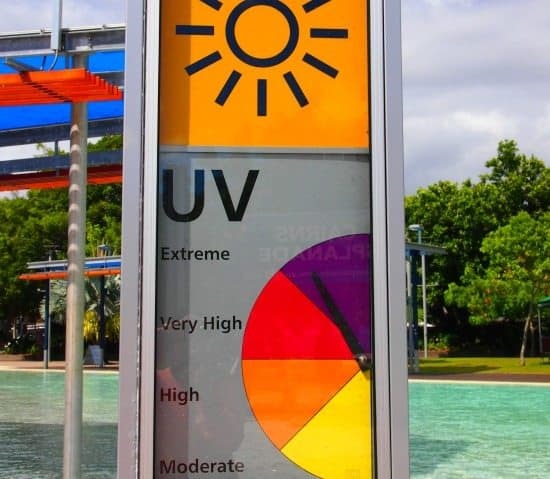 There is also a small waterpark in Cairns, see this post on places to get wet in the area. 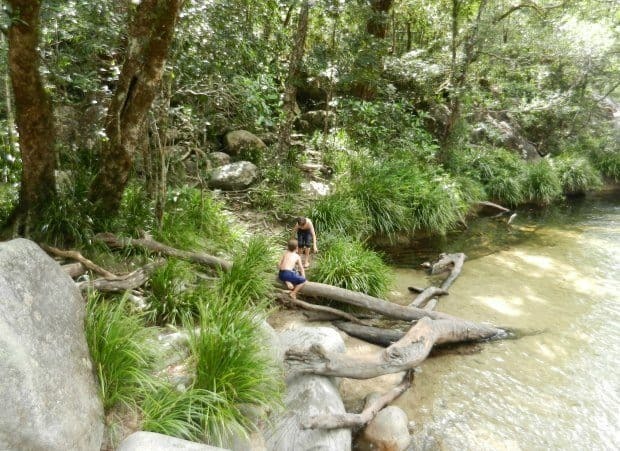 There are a few natural rainforest swimming spots nearby, we particularly enjoy Crystal Cascades. Fresh water swimming in this part of the world is an experience you shouldn’t miss. Maybe stinger season isn’t the best time to visit Port Douglas, but you’ll find plenty of things to do in Port Douglas, safely and enjoyably at most times of the year. Fabulous Four Mile Beach, Port Douglas. Stinger season is just one of the costs of living in the tropics, sharing our lives with deadly but fascinating creatures, crocodiles, snakes and spiders. It’s always beautiful here in Port Douglas and the wildlife and scenery are stunning, all year round. Four Mile beach, our home, is beautiful, but once the dangerous jellyfish arrive and stinger season starts, just use a bit of common sense. You have to make your own call, you’ll be fine inside the stinger net and you’ll be safer still on the reef, just keep it in your mind and listen to the lifeguards, they drag the net every day to check for stingers. They know the beach and know when the risk is high, they will tell you. 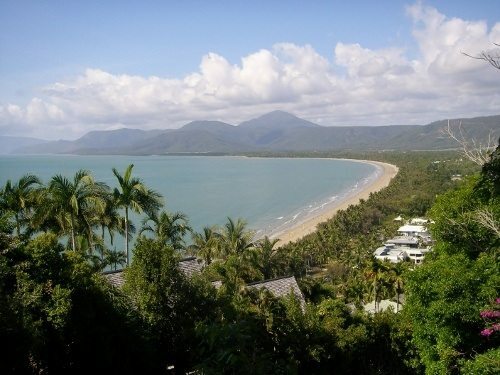 Search here for Port Douglas Hot Offers. Thank you for visiting, this is one of the most popular and well used page on our website. Would you tell me in the comments how we can improve it and help you with Stinger Season or Far North Queensland even more? Have a great time! I was planning to have a few days on a liveaboard from Cairns in early March. However, I’m concerned at the extreme heat and unusually high humidity you guys are having at the moment, this combined with Stinger Season is making me think more than twice! I only have a week to visit this trip, but if I come back next year in October I could have a whole month touring the Queensland coast. Is the weather generally more pleasant in October compared to March? Will visibility be better for snorkelling, or about the same? When is the earliest that Stinger Season is declared in Cairns? October and March are both pretty good. It should have cooled down a fair bit by March. Live aboards are fabulous, we’ve done a couple, stinger risk out on the reef is pretty low, we were out there a couple of weeks ago. Decent viz, not perfect, but much better than I expected. Earliest stinger season call…don’t know sorry, would have to Google for records back through time. Hi there we are hoping to visit port Douglas in early September. Is it safe to swim at that time of the year?? What about going out to the reef?? Dates of Stinger Season are above. Once the lifeguard find the first one, it’s officially stinger season, so the date varies. September in not usually ( never, that I know of) in Stinger Season. As I say above, the reef is safer than the coastal waters because the jellies like to hang out in the mangroves before being flushed into the sea by the rains. Is it ever 100% safe, probably not. Is September a good time, yes. We will be visiting Cairns from the middle to the end of October to snorkel and dive, mostly along the Great Barrier Reef. Do you recommend trying to buy a stinger suit by mail order (probably Amazon) in advance or are they available and at reasonable price locally? We are considering waiting till we got to Cairns so we could try them on and ensure they are the correct size. If you’re going out on the boats they will usually have stinger suits on board because you’re not allowed in the water without one. I generally wear my wetsuit instead. Buy one online if you can, they’re hard to find locally and Australia is expensive. I enjoyed reading your article! I’ve been to Palm Cove a few times now (I’m from Melbourne) and have visited once in summer and I did swim in the nets with no problem, unfortunately the water was no relief from the heat as it was the temperature of a warm bath!! Nowadays we try to come up during September/October. Do you ever have stinger problems at this time? I ask as the weather trends are changing with unseasonably warm winters! As soon as even 1 stinger is found it’s declared stinger season and the nets go out Florencia. It’s at a different time every year, but I haven’t tracked dates for the last few years. I’ll research it tonight for you and add dates and years to the post. Cheers. If you could let me know that would be really great as we are coming up soon! Thanks again for a very informative article! The only information I can find so far Florencia is that they only start dragging for stingers in Port Douglas in October ( This from Port Douglas Tourism). I can’t find any reliable dates, but I’m still looking. I wouldn’t suggest swimming at the beach at all during stinger season. I was stung inside the net at Palm Cove in mid December 2014 and I was only half in the water! I was laying at the shore playing with shells with the tiny waves lapping over my back when I felt the sting on my lower back. I was alone and new to cairns and had never been in an ambulance before. A very scary experience where I would have died had a stranger not made me go up and tell the life guard instead of driving home and hoping it wasn’t a deadly jelly that stung me. It was an Irukanji that stung me and the symptoms were horrible. I couldn’t breathe and my ability to breathe worsened as time went on. I had shots of extreme pain running through my body, could barely stay conscious, felt like I was slowly dying and felt like I just wasn’t there. I can’t describe it all, it felt that my strength was evaporating from me. Later at the hospital I was vomiting, not sure if that was from morphine or venom. And I felt lousy for the next couple of days recovering. I was playing with a 6 year old girl when this happened and considering how the venom affected me, I’d hate to know what would have happened if it was her that got stung. I’d advise not running the risk, especially with kids. THE NETS DO NOT KEEP OUT IRUKANJI!! The beaches here in Cairns close all the time from these tiny jellyfish getting inside the nets. We all know that Hayley, some just think it’s OK, some, like you, get very unlucky. I keep my kids out in Stinger Season. I’m so sorry you had that terrible experience. Would April be a good time to visit Cairns e.g avoid stingers, water temp e.t.c? Yes, but Stinger Season often lasts into May Brent. Ive lived in Newell Beach for 20 years. I try to swim in the sea every day. Cos im still here and I have never heard of a stinger case here.. crocs well ya gotta be smart and follow the rules about them. Is early October safe to swim in the ocean without a stinger suit? You should be fine Sheena. The date the nets go out is different every year, it’s usually the start of November.If there is any danger of stingers the nets are out. Early October is actually a great time, warm, clear waters. Enjoy! That sign would certainly not tempt me to get into the water in the summer! I don’t get the purpose of the net – are you supposed to try and scoop them all out of the water before you go in? I don’t think I’d trust that at all. What if you miss one? Yikes. I think I’d stay out of the water too. No, Sonja, you swim IN he net, it is a large enclosure, supposed to keep the singers out. they aren’t very effective, unfortunately. Crocodiles have also been known to find their way into the nets. You take your life in our hands round here! Thanks for reading and aking he time o commen Sonja. I have never heard of stinger suits. In Texas’ Galveston Bay, the jellyfish we have hurt but aren’t deadly. You don’t jump in if you see them, but otherwise, you take your chances. 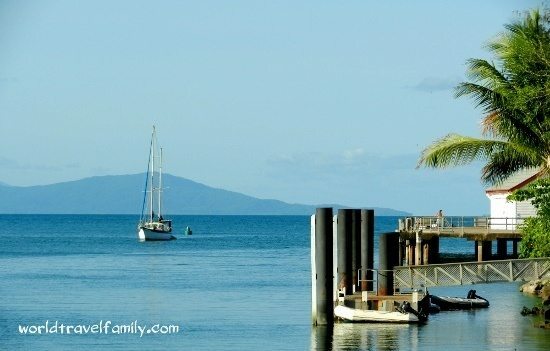 We’re headed to Cairns or Port Douglas around Christmas. Will it still be stinger season? Is it a problem at the GBR so we shouldn’t plan on snorkeling? Thanks Suzanne, but you have London, The Natural History Museum, London Zoo, The British Museum. Port Douglas is pretty, but you know where I’d rather be! We’d love to visit you over there again soon. Yes it is a bit of a worry but it’s so lovely to live near the beach and sea. I really miss that while I am living in Herts UK, not a snake in sight either! Hi Danielle and Lisa, my first two comments on my brand new website, I’m so happy! Thank you so much. Lisa, you are lucky you’ve got that fabulous lagoon pool, we’ll be down there taking full advantage pretty soon, just a few weeks to go before the nets are out. We live in Cairns and there will be no more beach swimming for our kids until after the stinger season either. It is just a risk I am not willing to take. 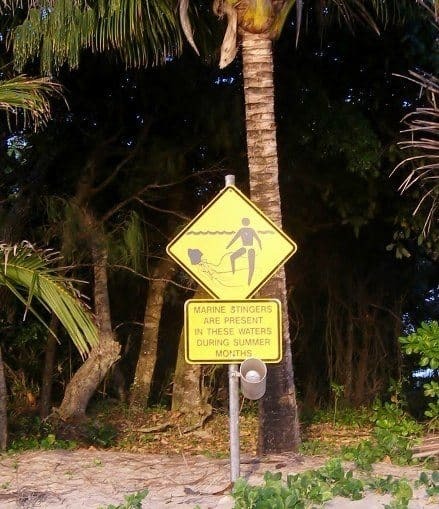 It is a lovely looking beach – one look at that sign would guarantee that I wouldn’t get either of my kids anywhere near it though!